After five months of sustained assaults on Gaza by the Israeli army, nowhere is the sudden ceasefire more welcome than in the town of Beit Hanoun. At one point it was completely occupied by tanks and troops who killed some 60 militants and civilians in the course of one week alone. And nowhere in Beit Hanoun suffered more than Hamad Street. This is where nearly 20 members of one family died in what the army said was a misdirected artillery barrage. A piece of shrapnel ripped through Muhammad Adwan's thigh during the bombardment - but he survived. And in the first hours of the truce he sat in a chair on the Hamad Street - enjoying the new calm. "God willing, it'll last for 10 years," he said. 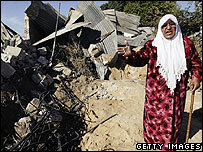 "We don't want anyone to break the ceasefire - Palestinian or Israeli. "Our children are scared and their children are scared. War is dangerous for us and for them. To live in peace is better." The Israelis said their assaults on Beit Hanoun were part of efforts to halt the firing of rockets from the area into a nearby Israeli town. Two civilians died in the town, Sderot, in recent attacks. Groups like Islamic Jihad said that their crudely-made missiles were a response to Israeli raids and air strikes. And elements in both Islamic Jihad and Hamas threatened the truce within hours of its start. They launched fresh volleys of rockets into Israel. But back on battered Hamad Street, Mr Adwan had this message for the militants. "That's enough with the rockets," he said. "That's enough." He was sitting just metres from where his brother was killed as he tried to rescue the injured on that morning when the shells rained down. For now at least, not just on Hamad Street, but all down the length of troubled Gaza there is something very unusual in the air - a faint sense of hope. But of course everybody wonders whether the truce can hold. And they know that dangers lie in the situation on the West Bank. It is very firmly under Israeli military occupation, and it is not included in the ceasefire agreement. 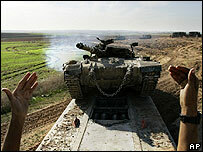 Continuing tension there could badly sour the atmosphere in Gaza. And that process has already begun. 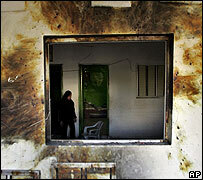 With the truce less than 24 hours old Israeli troops raided the West Bank town of Qabatiya. They killed a militant from the Popular Resistance Committees (PRC), and a woman in her 50s. "We warn the world that if the Zionist aggression in the West Bank doesn't stop this truce will collapse," said a spokesman for the PRC. Soon afterwards rockets were launched from Gaza by militants who said they were not bound by the truce and were hitting back for the Qabatiya raid. There were no injuries, and there was no Israeli response. The long term survival of the ceasefire may depend on whether it can be extended to cover the West Bank. But the truce may be a little more robust than it looks. The Israelis might prove surprisingly tolerant of minor Palestinian breaches. They are acutely aware that they ran out of viable military options in Gaza. 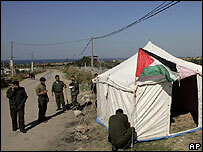 The Israel army brought huge pressure to bear on the territory day after day for months. Its declared objectives were to work to secure the release of the captured Israeli soldier Gilad Shalit, and to counter the groups that were firing rockets. The prolonged assault killed hundreds of Palestinians, many of them civilians, and it did further damage to Israel's image in the world. But in the days before the truce the militant missile attacks were still coming in the usual numbers. And when the troops withdrew, they left Cpl Shalit here in Gaza. For years Israel's generals have failed to find an answer to the rocket fire, and now their political masters may be quite keen to see just how much mileage there is in the ceasefire option. As long as the truce holds, it will continue to improve the atmosphere in Gaza. And that may create an easier climate for progress in other areas. A major unresolved issue is the effort to form a government of national unity. This would bring the ruling Hamas movement and the Fatah party into a coalition with other factions. The aim is to create a more moderate looking administration than the current Hamas government. It has been shunned by the West and crippled by American and Israeli sanctions on account of its refusal to renounce violence and accept Israel's right to exist. But the coming of the ceasefire will have little direct bearing on the quest for a unity government. This is an issue very much governed by the hard facts of the Palestinian political arena - and by the demands of the big Western aid donors. Hamas has invested huge amounts in its drive to secure control of the government. It will give up as little as it possibly can in the coalition talks. And its rivals in Fatah are looking to claw back as much as they are able to of the power that they lost when Hamas trounced them in January's general election.